There is a growing interest in the use of 18F-FDG PET-CT to monitor tuberculosis (TB) treatment response. However, TB causes complex and widespread pathology, which is challenging to segment and quantify in a reproducible manner. To address this, we developed a technique to standardise uptake (Z-score), segment and quantify tuberculous lung lesions on PET and CT concurrently, in order to track changes over time. We used open source tools and created a MATLAB script. The technique was optimised on a training set of five pulmonary tuberculosis (PTB) cases after standard TB therapy and 15 control patients with lesion-free lungs. We compared the proposed method to a fixed threshold (SUV > 1) and manual segmentation by two readers and piloted the technique successfully on scans of five control patients and five PTB cases (four cured and one failed treatment case), at diagnosis and after 1 and 6 months of treatment. There was a better correlation between the Z-score-based segmentation and manual segmentation than SUV > 1 and manual segmentation in terms of overall spatial overlap (measured in Dice similarity coefficient) and specificity (1 minus false positive volume fraction). However, SUV > 1 segmentation appeared more sensitive. Both the Z-score and SUV > 1 showed very low variability when measuring change over time. In addition, total glycolytic activity, calculated using segmentation by Z-score and lesion-to-background ratio, correlated well with traditional total glycolytic activity calculations. The technique quantified various PET and CT parameters, including the total glycolytic activity index, metabolic lesion volume, lesion volumes at different CT densities and combined PET and CT parameters. The quantified metrics showed a marked decrease in the cured cases, with changes already apparent at month one, but remained largely unchanged in the failed treatment case. Our technique is promising to segment and quantify the lung scans of pulmonary tuberculosis patients in a semi-automatic manner, appropriate for measuring treatment response. Further validation is required in larger cohorts. Positron emission tomography/computerised tomography (PET-CT) is well established in the diagnostic workup, treatment planning and response assessment of cancer and various inflammatory and infectious diseases [1, 2]. The most commonly used PET tracer is 18F-fluorodeoxyglucose (FDG). It reflects glucose metabolism and shows increased uptake in areas of inflammation. PET scanners measure the radiopharmaceutical concentration in tissue [3–5]. Uptake intensity in tissue is variable and influenced by numerous patient-, timing- and equipment factors, which is why the lesion-to-background ratio is often considered a more robust measure than absolute uptake . Several semi-quantitative measurements of PET voxel intensity have been developed, of which standardised uptake value (SUV), is most commonly used. It compensates for variation in body size, injected activity and radioactive decay. The metabolic lesion volume (MLV), maximum and mean SUV within the lesion (SUVmax and SUVmean) and the total glycolytic activity (TGA = MLV × SUVmean) are the PET parameters most commonly used for lesion quantification [3, 4, 7–9]. The borders of the MLV can be delineated visually or using various semi-automated techniques, however no single technique has proven optimal for all applications . In most cases lesion delineation is still performed manually, based on visual interpretation of PET or CT images. This is prone to inter- and intra-operator variation, especially for PET due to its lower spatial resolution and inherent noise [8–15]. Multiple methods are used and proposed to decrease variation in lesion segmentation. These include using reference values to normalise the lesion- to- background uptake intensity by comparison to liver or mediastinal blood pool uptake [16–18] and the use of automated segmentation techniques. Automated segmentation techniques include thresholding techniques, gradient-based techniques and stochastic- and learning-based computerised methods . Thresholds may be fixed or adaptive. Adaptive thresholds utilises image parameters, such as lesion-to-background ratio, mean background intensity and estimated lesion intensity in algorithms to define the threshold. Some studies also focused on the quantification of images from CT scanners, which measure the density of anatomical structures and lesions in Hounsfield units (HU). It is not a functional scan and is less prone to interscan variability. Only a few studies have evaluated densometric quantification of CT scans in diffuse lung disease; however, it appears to be reproducible and correlate well with other disease markers [19–22]. Joint segmentation of fused PET and CT images has shown improved robustness compared to methods using only data from PET . The shortcomings of sputum culture to accurately indicate when TB treatment has achieved sterilising cure [24–26] escalate the cost to develop improved TB treatment options. This has led to a growing interest to use PET-CT imaging to monitor TB treatment response [27–29]. In animal models, FDG PET-CT has been used to accurately describe disease progression and response to treatment in pulmonary tuberculosis (PTB) [30–35]. Human studies have also shown PET-CT of promise to monitor the effect of treatment using simple descriptive techniques [27, 31, 36–41]. We recently reported PET-CT findings in PTB patients, before, during and after therapy, and found strikingly complex and heterogeneous lesion responses . Reproducible segmentation and quantification becomes particularly important in diseases with heterogeneous morphology, vague borders and multi-focal distribution throughout an organ or system, such as TB or sarcoidosis [31, 41] (example shown in Fig. 1). This is especially important when accurate tracking of changes over time is required. 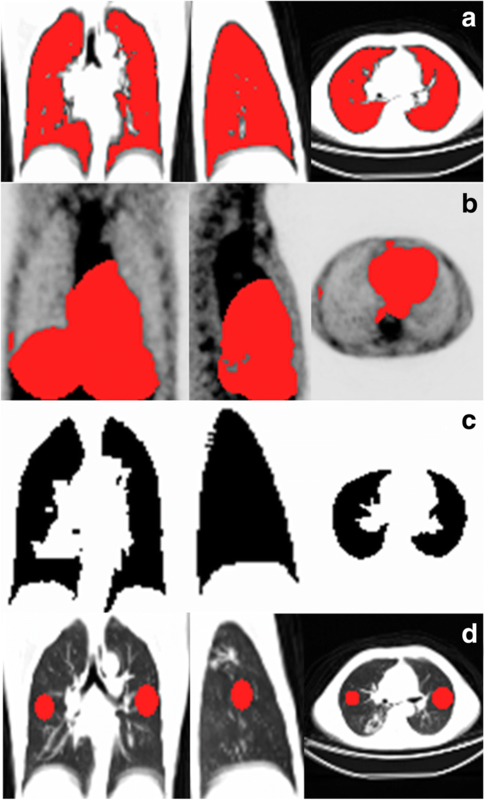 In most animal model PET-CT studies, the authors used manual lesion delineation to track changes throughout the lungs, or in individual lesions [30–35]. 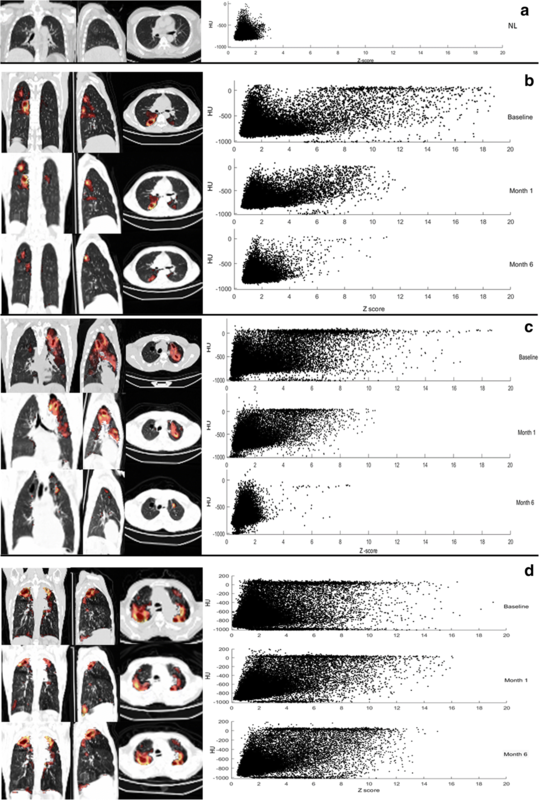 Two separate human studies implemented whole lung quantification of PET (using fixed thresholds of SUV > 1 and SUV > 2, respectively) and semi-quantitative CT reader scores [31, 41]. These found that quantified PET images were more robust than reader-based CT scores, and seemed to accurately measure changes in disease burden over time. To account for the spatially complex lesions, two studies successfully utilised computer-aided segmentation, respectively, based on affinity propagation and both interactive region growing and adaptive thresholding, in PET images of TB-infected small animal models [43, 44]. In this report, we describe a semi-automated, voxel-based technique developed for both PET and CT quantification to standardise and segment widespread and heterogenous lesions throughout the lung and reproducibly measure disease burden over time. The method was optimised on a training set of 15 lesion-free lung scans obtained from patients undergoing PET-CT scans for non-pulmonary clinical indications, as well as scans from five PTB patients showing residual lung lesions after treatment. As a proof of concept, we applied the methodology to quantify disease burden on an independent test set of PET-CT scans from five controls and serial scans from the first five patients participating in the PTB cohort study, mentioned above . The controls were from the same communities (Cape Town, South-Africa), and had contact with PTB patients, but were sputum culture negative for Mycobacterium tuberculosis and had no active lesions visible on PET-CT scan. PTB cases were all diagnosed with drug-sensitive TB strains and were HIV negative. Cases underwent scans at time-points within 1 week from initiation of treatment (Dx), after 1 month of treatment (M1) and after 6 months of treatment (M6), corresponding with the duration of standard TB therapy. At the end of treatment, four of the PTB cases were sputum culture negative and classified as cured by healthcare providers in charge of treatment, while one was still sputum culture positive and diagnosed as a failed treatment outcome. The study design is summarised in Table 1. PET-CT scanning was performed with a Philips Gemini Big Bore time-of-flight scanner according to internationally accepted guidelines . Patients fasted for 6 h before FDG administration, but were encouraged to hydrate well. According to body weight, participants received 185–259 MBq of 18F-FDG intravenously 60 min before scan acquisition. PET images were reconstructed to 4 × 4 × 4 mm voxels using an iterative algorithm including time-of-flight information and corrections for random events, scatter, deadtime, attenuation and decay. The CT scan parameters were set at 120 kV, 100 mAs, without dose modulation with 1.17 × 1.17 mm pixels and a 3 mm slice thickness. We exported images from the PET-CT workstation in DICOM format and converted to ANALYSE file format  using MRIConvert . To ensure reproducibility and facilitate direct comparison, we co-registered each patient’s follow-up scans with the baseline CT, using Statistical Parametric Mapping (SPM8)  with MATLAB 2013b (Mathworks Inc.). During the co-registration (using within-subject rigid-body model), CT images were re-sliced to the voxel matrix of the corresponding PET scan (using trilinear interpolation). This allowed direct voxel-based comparison of each patient’s PET and CT images. For each series of co-registered CT studies, we generated a volume of interest (VOI) as a lung mask (Fig. 2a), in MRICro version 1.39  on overlaid CT images, using the 3D region-growing, gradient-based tool. This allowed setting the origin, radius and difference from origin and edge gradient on the overlaid CT images. We combined this with manual corrections, to avoid the exclusion of dense lesions extending into the pleura from the VOI. The lung mask excluded the lung hila and main pulmonary vessels, but included smaller vessels. As a final adjustment, we created a VOI of organs around the lungs that included in the lung fields by misregistration [usually the liver, spleen and mediastinum (Fig. 2b)], with the region-growing tool on the PET scans, and then deleted overlapping voxels from the lung mask. We converted the mask to a binary image and filled any holes in the mask, using ImageJ software  (Fig. 2c). We selected two areas of normal lung parenchyma (NL) as a reference VOI to standardise uptake in lung voxels (Fig. 2d) . Each NL volume consisted of spheres 15 to 25 mm in diameter that visually appeared lesion-free on all co-registered scans. To enhance the representivity of the sample, the spheres were selected in opposite lungs or in some cases in different ipsilateral lobes, depending on the distribution of lung pathology. in which μNL and σNL are the mean and standard deviation of PET counts within the normal volume for each study. The Z-score provided a statistical way to standardise relative intensity of FDG uptake throughout the lungs. All lung voxels exceeding a defined Z-score threshold were defined as part of FDG-avid lesions. We then exported images of segmented lesion volumes to view alongside the original images for visual quality assessment. To determine the optimal Z-score threshold, we processed a set of 15 lesion-free lung scans with reiterations of increasing Z-score thresholds, to minimise false positive findings. As expected, at a low Z-score threshold, the volumes segmented as abnormal in these healthy lungs were high, but decreased to a value close to zero for Z ≥ 8 (Fig. 3). To minimise false negative findings, we also tested increasing Z-score thresholds on scans that showed residual lesions with minimal or mild intensity and complex morphology, obtained from five PTB patients after treatment. Intensity was graded using an adaptation of the Deauville classification [18, 42]. A threshold of Z = 8 delineated all lesions with minimal FDG avidity, while Z = 9 delineated all lesions with mild FDG avidity, but failed to detect some lesions with minimal FDG avidity (Fig. 4). We thus chose a cut-off of Z = 8 based on its low false positive and false negative rates. For comparison, two readers manually delineated FDG-avid lung lesions of diagnosis (Dx) and M6 scans, based on visual assessment. We also applied different thresholds for automated segmentation within the lung mask, namely SUV > 1 and T40%. SUV > 1 is a fixed threshold, used in previous TB studies  to delineate lung lesions on PET, while T40% refers to 40% of the maximum intensity in a VOI, previously used in cancer studies . Concurrently with the PET segmentation and using the same lung mask, the MATLAB script also segmented the CT images into five categories based on the density of each voxel compared to set values obtained from literature [21, 41]: (1) low density (< − 950 HU), attributed to cavitation or extremely hyper-inflated lung tissue (Vlow); (2) normal density, between − 950 HU and − 500 HU; (3) soft lesion volume (Vsoft), from − 500 HU to − 300 HU, usually tree-in-bud lesions or nodules, but may also include regular, medium to large vasculature; and (4) medium lesion volume (Vmedium) from − 300 HU to − 100 HU. This category should include very little normal lung tissue and usually consists of nodular infiltrates, but may also include hard lesions in early progression or partial resolution; (5) hard lesion volume (Vhard), above − 100 HU, are usually due to consolidation, cavity walls, bronchial thickening or calcified fibrosis. We performed visual checks of the accuracy of CT lesion delineation, based on these fixed density thresholds. For lesions with increased density (Vsoft, Vmedium, Vhard), the segmented areas corresponded well to lesion morphology. However, using − 950 HU as the upper limit for low-density lesions was not specific enough for cavitation and the segmented areas in some cases included bullae, bronchiectasis, and severe emphysema. This necessitated an additional step to measure the volumes of individual cavities for each scan. This was done using the MRICro’s 3D region-growing tool (boundary-based segmentation). After segmentation, the program quantified the following PET parameters: (1) MLV, (2) the mean Z-score in the MLV (Zmean), (3) TGA (MLV × SUVmean), (4) total glycolytic activity index (TGAI): the product of the MLV and mean lesion-to-background intensity (TGAI = MLV × mean lesion counts/mean counts in normal lung). In addition, the program also measured the total lung volume [TLV (ml)] and the volumes of each abnormal density category on CT, i.e., Vlow, Vsoft, Vmedium, and Vhard, as well as a combined PET-CT metric: MLVabN [the intersection of MLV and area with increased density on CT (≥ 500 HU)]. Re-slicing of the CT to the corresponding PET allowed the program to compare CT density and PET intensity, directly per voxel. The two manual readers are clinicians, with experience in the diagnosis and treatment of pulmonary tuberculosis. They are also clinical trial investigators and trained in PET-CT evaluation for a phase 3 clinical trial that aims to use PET-CT parameters to guide TB treatment duration . Manual segmentation of FDG-avid PET lesions in PTB scans took roughly 30–90 min per scan. Volumetric comparisons were performed using the dice similarity coefficient (DSC), a validated approach to measure spatial overlap [51, 52]. In addition, the true positive volume fraction (TPFV) was calculated to indicate segmentation sensitivity and one minus the false positive volume fraction (1-FPVF) to indicate specificity. Statistical analysis was performed using Statistica Version 13©. For numerical variables we report median, range and 25th and 75th percentiles to accommodate the modest sample size included in this pilot project. Agreement measures are reported using a Bland-Altman plot showing only bias and values and not confidence intervals and standard deviations. We report the correlation coefficient and p values for correlations between numerical variables. We successfully implemented the quantification methodology in all controls and cases. Creating the masks required knowledge of lung anatomy, while the other steps required basic computer literacy. The user input required for quantification could be divided into (1) file management (including the selection, indexing and formatting of image files) and (2) creating VOIs for lung masks, background references and areas affected by motion misregistration. The time required to quantify scans ranged approximately from 10 min for a lesion-free lung scan at one time-point, to 45 min for a three time point series of extensively diseased lungs. Where applicable, cavity volumes were easily measured with MRICro’s 3D region-growing tool on CT, taking less than 1 min per scan. The auto-segmented MLV for each scan corresponded well with visual assessment of the PET scans. No false positive segmentation was noted on control scans. In the PTB lung scans, all auto-segmented MLVs corresponded to areas that appeared FDG avid. No visually FDG-avid lesions were missed by auto-segmentation. FDG-avid lesions were also segmented using T40%. 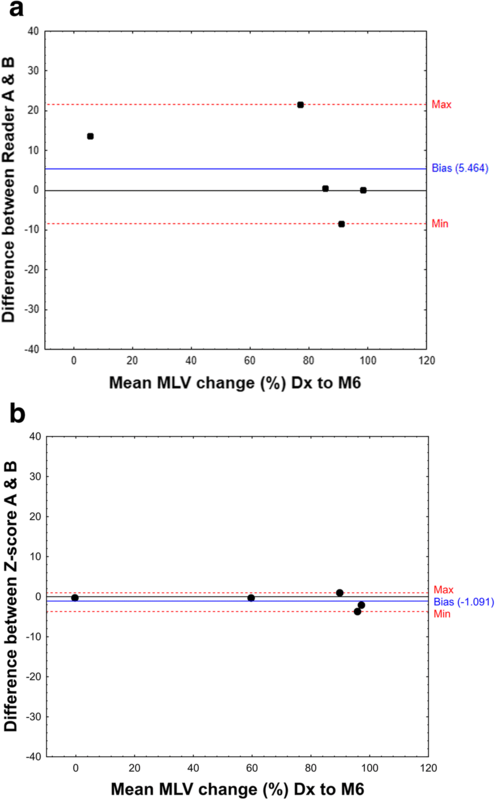 However, when max lesion SUV decreased during treatment, the MLVs became progressively more inclusive and did not correspond well to visual assessment. As such, we abandoned T40% as a method to monitor treatment response in a whole lung VOI. Table 2 shows a summary of DSC values (Table 2), true positive volume fraction (TPVF; Table 2), 1-false positive volume fraction (1-FPVF; Table 2), between readers and automated thresholds at Dx, M6 and combined. Individual segments corresponded better at Dx than M6, independent of which segmentation method used. DSC between manual and Z-score segmentations (Z-A to reader A and Z-A to reader B) was slightly lower than between the manual readers (reader B to reader A), but higher than DSC between manual and SUV > 1 segmentations. The same trends were noted in regard to 1-FPVF(%) values. In contrast, SUV > 1 segments performed better in regard to TPVF comparison than either Z-score or manual segmentation. The same behaviour was also observed when comparing to either unions or the intersections. The DSC between MLV segmented using the Z-score and the MLV intersection between the readers was 0.73 (range 0.46–0.94), while the DSC between the readers’ MLV union was 0.72 (range 0.3–0.94). The median DSC between the MLV segmented using SUV > 1 and the readers’ segments intersection was 0.61 (range 0.11–0.88) and 0.7 (range 0.18–0.92) when compared to the union of the manual segments. Inter-user Z-score segmentation (created by different spheres and lung mask) and inter-reader manual segmentation showed similar variability at single time-points, with a median DSC of 0.83 and 0.78 respectively (Table 2). However, there was a much better agreement in percentage change from diagnosis to M6 for inter-user Z-score segmentation than for manual inter-reader segmentation. The difference between the percentage change from Dx to M6 in MLV lesions volume ranged from − 3.69 to 0.96 for inter-user Z-scores and − 8.44 to 21.51 for inter-reader MLV change (Fig. 5). Z-score segmentation correlated well with SUV > 1 (median DSC = 0.88). In addition, there was a high correlation between TGA (product of SUVmean and MLV in SUV > 1) and TGAI (product of mean lesion-to-background intensity and MLV in Z-score > 8) across time-points (Dx, M1, M6, Fig. 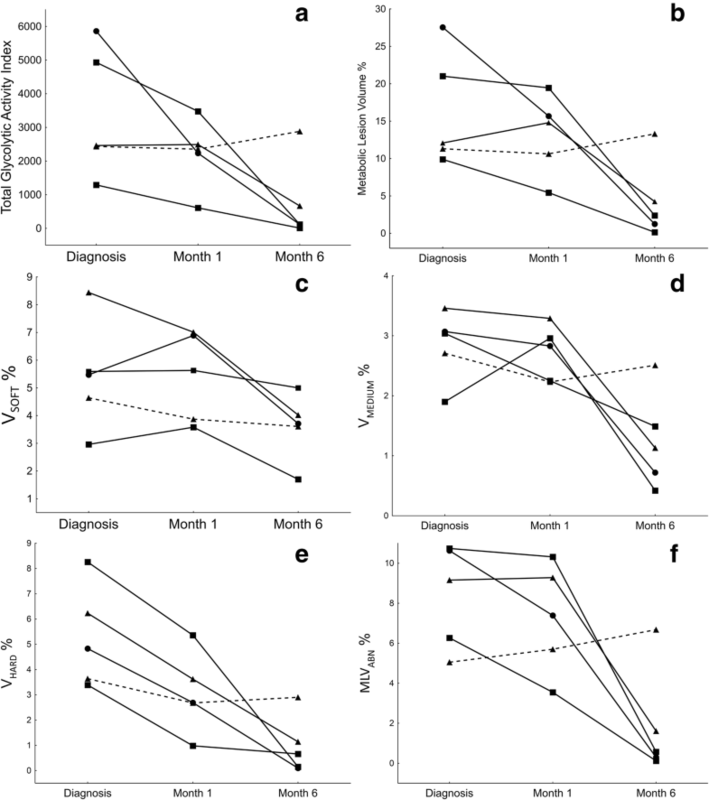 6a), which improved when assessing change in inflammatory burden over time (Fig. 6b, c). Representative quantification patterns of scans from a control case and PTB patients before, during, and after treatment, with an overlay of the segmented MLV and a scatterplot representing the voxels from each scan, are shown in Fig. 7. The scatter plot of a control scan is shown in Fig. 7a. The cured patients’ values (Fig. 7b, c) change toward normal at follow-up, while for the patient who failed treatment the pattern remains clearly abnormal on the density and intensity axes (Fig. 7d). Figure 8 demonstrates the dynamics of different scan parameters during treatment of the five PTB cases, in relation to clinical outcome. The segmented TGAI (Fig. 8a) of three out of four cured cases already showed partial reduction (30–62%) at M1 and continued to decrease markedly toward the end of treatment. The fourth cured patient showed a slight increase by M1, but significant reduction by M6. After 6 months of treatment, all the cured patients showed marked reduction (80–99%), but only one patient showed nearly complete metabolic resolution. The patient that failed treatment remained unchanged over the first month and deteriorated by M6. The MLV for this patient (Fig. 8b) showed very similar patterns during treatment. The combined lung volume with increased density (Vsoft + medium + hard) followed a similar trend, although the decrease from Dx to M6 was less marked (41–83%) than MLV changes and the failed treatment patient showed only slightly decreased values from Dx to M6. In the breakdown of lesions of different density (Fig. 8c–e), all cured patients showed a marked volume decrease in hard lesions, already noted by M1 (35–71% reduction) and continued toward M6 (81–98% reduction). The volumes of medium and soft lesions were more variable, and a relatively large residual lesion volume was present at M6 for most cases. After 1 month of treatment, in cured patients, MLVabn (Fig. 8f) decreased modestly in two and remained stable in the other two. The failed treatment case showed a 13% increase. At M6, however, all cured cases’ MLVabn had decreased markedly (82–98%), while the failed treatment case showed a further increase. In this paper, we present a technique to reproducibly quantify pulmonary tuberculosis lesions on PET and CT. We used patient-specific reference volumes to reduce intra- and interscan variability on PET and auto-delineation to reduce inter-reader and inter-user variability when assessing multiple widely distributed lesions with complex morphology. The technique quantifies lesions throughout the lungs in order to measure the central trend of disease progression or resolution, thus compensating for the variable response of individual lesions during PTB treatment. The technique introduced some novel concepts in PET-CT analysis including the use of a patient-specific reference volume to standardise lung uptake (lesion-to-background), whole lung automated segmentation of CT lesions and bivariate quantification of PET and CT images. It also reapplies concepts previously used in other settings, such as co-registration of corresponding scans at different time-points, whole organ (semi-)automated segmentation of PET uptake, and joint segmentation of PET and CT .
Optimal adaptive thresholds for auto-segmentation of PET scans were determined using a set of control lung scans and scans containing lesions with minimal to mildly increased uptake. Density thresholds for CT scans were determined using values previously reported in literature . We compared the Z-score delineation to manual delineation by two independent readers and a fixed threshold previously used in a TB trial (SUV > 1) . 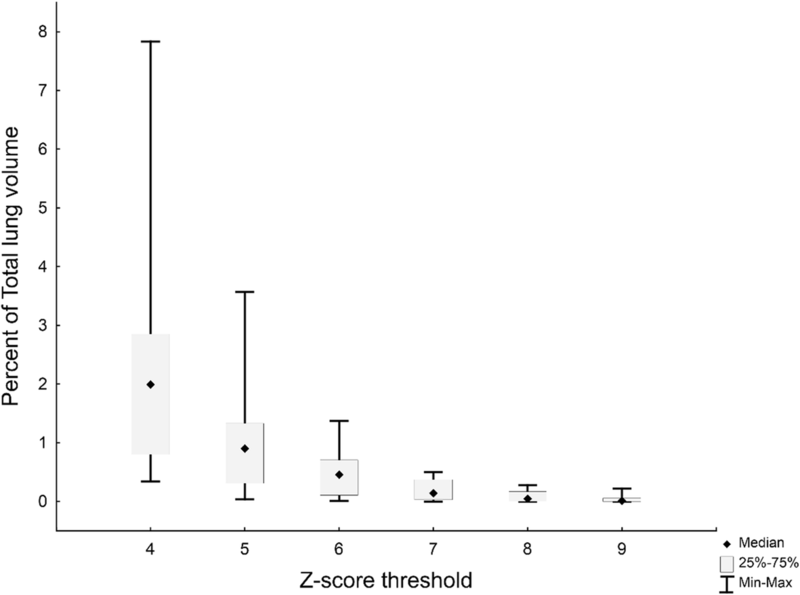 There was better correlation between the Z-score and manual segmentation when compared to the fixed threshold. We also found decreased inter-user variability when measuring response to treatment when compared to manual segmentation. However, there was still some inter-user variability at single time-points, which would not apply when using a fixed threshold (SUV > 1). Both automated thresholding techniques saved time and appeared highly sensitive. We also applied a gradient-based threshold (T40%); however, it did not appear to be appropriate to measure response to treatment in whole lung VOIs. After treatment, agreement between all thresholding techniques and readers were lower than previous reports only focussing on diagnosis . However, this was expected in highly complex lesions at the very edge of FDG avidity, found after treatment. There was good correlation between TGA (based on mean SUV and volume) and TGAI (normalised to background lung activity), especially when measuring changes over time. We tested whether the technique was accurate enough to measure changes over time, by applying it to independent pilot sets of control cases and PTB cases during treatment. The quantified variables detected marked changes within 1 month of treatment. The metrics corresponded well with visual scan interpretation, clinical outcomes and the qualitative classification allocated during analysis for the parent study. It also provided a range of additional information. Some challenges and potential drawbacks were encountered during this pilot application. While using the 3D region-growing tool in MRIcro was user friendly and easily reproducible, some manual input was required when drawing the lung mask, to include dense lesions extending into the chest wall, and areas of motion misregistration. 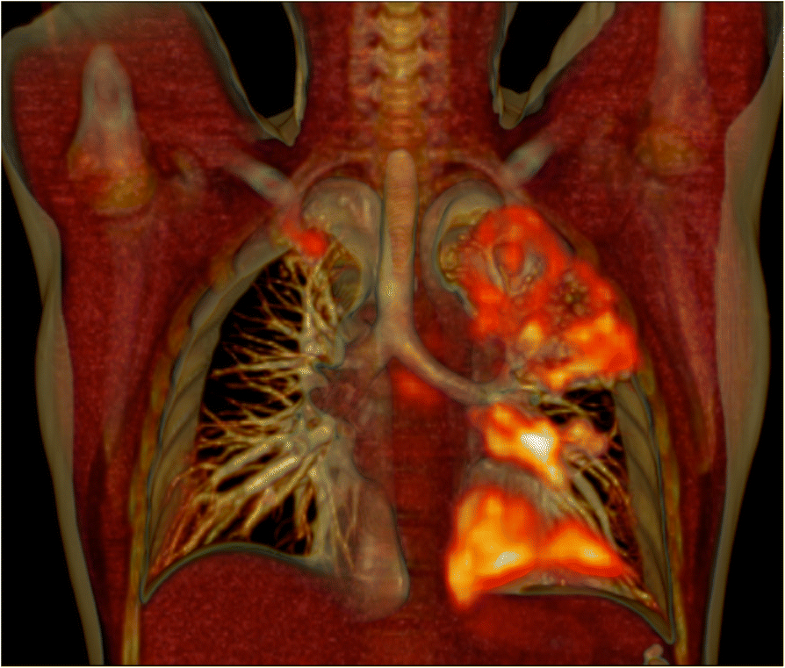 In the future, computer-assisted drawing tools or fully automated lung atlas segmentation and correction of misregistration should decrease inter-user variability and time requirements of any automated technique. Co-registering baseline and follow-up scans allowed the user to generate a single-lung mask and reference volume to use across all time points. This reduced interscan variability and saved time. It did not, however, allow for the measurement of changes in total lung volume over time, which may occur after lesion resolution with associated fibrosis. Re-slicing allowed direct voxel comparison of PET and CT components using a single VOI. A disadvantage is that there was a smoothing effect on the CT images. Using a density threshold was not specific enough to delineate cavity volume, and an additional manual step was required to perform this function. Using the mean and standard deviation of reference volumes to standardise lesion-to-background activity should decrease interscan and inter-patient variability compared to techniques that normalise the uptake to reference volumes from other organs or a theoretical whole body concentration. Thus, the Z-score takes into account the variability of FDG uptake in normal lung tissue and does not depend on dose or weight. The advantage of the latter is that changes in weight induce changes in SUV, while not necessarily inducing a change in FDG uptake. Semi-automatic delineation of the whole lung allowed for segmentation of multiple lesions with widespread distribution and variable intensity, size and morphology. This shows promise to reduce inter-reader variability, especially in a self-controlled study measuring changes after interventions. This technique to auto-segment and quantify multi-focal and complex lung lesions on PET and CT images shows great promise in a pilot set of subjects and required limited operator input. This study was only a small pilot study as proof-of-concept. Validation in a larger cohort, and comparison of scan metrics to clinical outcomes and biomarkers is required to determine indicators of prognosis and cure. Ultimately this methodology, or features thereof, could be incorporated into standard clinical analysis pipelines and research protocols. We thank our participants for their willingness to take part in this study. Further, we acknowledge the staff at the Stellenbosch University Immunology Research Group, the Western Cape Academic PET-CT Centre, Ithemba LABS, and Tygerberg Academic Hospital’s Nuclear Medicine Department and Pulmonology Unit, as well as the managers and health care providers from the City of Cape Town Health Department. The Catalysis Biomarker Consortium: Stephanus T. Malherbe1,2, Patrick Dupont3,4, Ilse Kant4, Katharina Ronacher1,2, Magdalena Kriel1,2, André G. Loxton1,2, Ray Y. Chen5, Laura E. Via5,6, Friedrich Thienemann6,7, Robert J. Wilkinson6,7,8,9, Clifton E. Barry III1,2,5,6, Stephanie Griffith- Richards10, Annare Ellman4, Jill Winter11, Gerhard Walzl1,2, Nelita Du Plessis1,2, Caroline G.G. Beltran1,2, Lani Thiart1,2, Gerard Tromp1,2, Lance A. Lucas1,2, Bronwyn Smith1,2, Kim Stanley1,2, David Alland12, Shubhada Shenai12, Lori E. Dodd13, and James M. Warwick4. Department of Science and Technology/National Research Foundation Centre of Excellence for Biomedical Tuberculosis Research and South African Medical Research Council Centre for Tuberculosis Research. Laboratory for Cognitive Neurology, Department of Neurosciences, KU Leuven, Belgium. Division of Nuclear Medicine, Department of Medical Imaging and Clinical Oncology, Faculty of Medicine and Health Sciences, Stellenbosch University, Cape Town, South Africa. Tuberculosis Research Section, Laboratory of Clinical Infectious Diseases, Division of Intramural Research, National Institute of Allergy and Infectious Diseases, National Institutes of Health, Bethesda, MD, USA. Department of Medicine, Groote Schuur Hospital, Faculty of Health Science, University of Cape Town, Cape Town, South Africa. Division of Radiodiagnosis, Department of Medical Imaging and Clinical Oncology, Faculty of Medicine and Health Sciences, Stellenbosch University, Cape Town, South Africa. Catalysis Foundation for Health, Emeryville, CA, USA. Center for Emerging Pathogens, Department of Medicine, Rutgers-New Jersey Medical School, Rutgers Biomedical and Health Sciences, Newark, NJ, USA. Biostatistics Research Branch, National Institute of Allergy and Infectious Diseases, National Institutes of Health Bethesda, Maryland, USA. Funding was provided by the Catalysis Foundation for Health, the Division of Intramural Research, National Institute of Allergy and Infectious Diseases, the South African National Research Fund and the South African Medical Research Council’s Clinician Scholarship Program, as well as the National Institute of Allergy and Infectious Diseases, International Collaborations in Infectious Disease Research. RJW is supported by the Francis Crick Institute, which receives its core funding from Cancer Research UK (FC00110218), the UK Medical Research Council (FC00110218) and the Wellcome Trust (FC00110218). He also receives support from the Wellcome Trust (104803 and 203135) and the South African MRC Strategic Health Innovations Partnership. STM receives funding from the EDCTP2 programme supported by the European Union (grant number CDF1576). The views and opinions of the authors expressed herein do not necessarily state or reflect those of the EDCTP. Datasets would be made available on request to the author. STM managed the patient recruitment, follow-up and sample collection; assisted in the programming; optimised the technique; performed the visual scan analysis; implemented the analysis and drafted the manuscript. JMW, IK and PD designed the technique, created the program, analysed the results and edited the manuscript. AGL, KR, LEV, CEB, JW, RYC and GW designed the study, analysed the results and edited the manuscript. MK, FT and RJW were involved in study design, patient recruitment and edited the manuscript. PA, AE and SG-R performed the visual scan analysis and edited the manuscript. All authors reviewed and agreed to the manuscript content. Ethical approval was obtained for all study-related activities from the Stellenbosch University Human Research Ethics Committee (reference numbers N10/01/013 and N14/10/155). All participants signed the informed consent. This manuscript does not contain any personal sensitive data and is therefore not applicable.